It's time to shake it up, baby. I'm not challenged by my normal sketching ways. I want more fluent, stronger linework than I can get with my Faber-Castell Ecco Pigment pen---my primary drawing instrument for the last two years. I want to sketch faster, I want to capture movement. AND I've become even MORE eager to get on with painting paintings, after another year of getting off track on this front. Of course, life this year has put the squeeze in often distressing ways on my studio time, but I can't continue to accept that as an excuse. If not me (to paint my paintings), who? If not now, when? 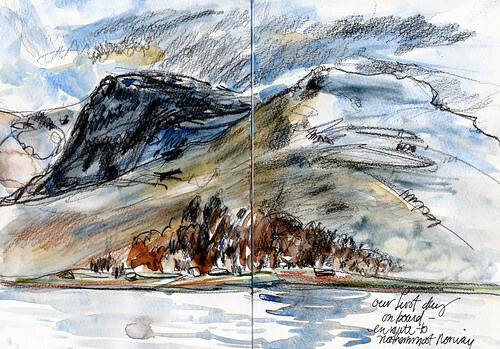 or like these from the recent Norway trip: or like this Memory Brush and wash sketch from 2008: This means using the Cretacolor oil pencils I told you about last time. It means using Memory brush pens, Pentel pocket brush pens, Pitt artist brush pens, dip pens. I want to sketch more urban scenes and include more architectural aspects of the world, these desires a result of my participation in Gabi Campanario's brilliant blog Urban Sketchers. If it weren't for Gabi and my fellow USk correspondents, this last goal would NOT be on my life To Do list, but they are and it most emphatically is! I'm going to follow another one of my self-created apprenticeships, this time to some of the the tips, techniques, and prompts provided by David Rankin in his book 'Fast Sketching Techniques.' I'll tell you more about this as I go along. It should be lots of fun and VERY useful. I'm also going to try again to take one of Veronica Lawlor and Margaret Hurst's reportage illustration workshops. Here's what happened last time. 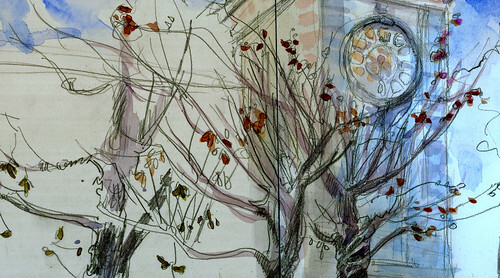 Their quick, dynamic, exquisite sketches are an unending source of inspiration. I'm continuing with my watery theme into this third year. I've got a whole logjam of koi paintings, for example, that are about to burst the dam. I want more texture, more layers, more transparency playing against opacity, bigger sizes, more movement, more fun, more, more, MORE! I'm sorry to be so greedy, but there you are. Opening disclaimer: these are the major trips I WANT to take this year. We shall see if I am able to, what with ongoing family matters that require my presence here, the rotten economy, and so on. One can (and this one does) dream. Trip to Turkey in April! Casey, Ippy, and I hope to visit a lovely friend of mine who lives in Ankara. We'd all four travel around a bit, sketching all the way! Trip to France in late May: this will be a relatively short trip to Normandy and Paris, to see gardens and friends. Of course, I'll be sketching all the way here, too! Trip... to coastal Norway again in late December!! My husband and I were both absolutely smitten and we would dearly love to spend a bit more time in that area. So, those are my three heart's desires for trips in 2010. These are my plans for my art life. Of course, I will have less time each week to make art, due to the aforementioned family obligations, but I'm not going to let that get me down! Let us go onward into the new year! May you accomplish everything your heart desires! * This is the fifth yearly art plan I've published on Laurelines. Here is 2006, the Plan. Here is 2007, the Plan. Here is the plan for 2008. Here is 2009, the Plan. I have just discovered your wonderful work and am totally smitten. 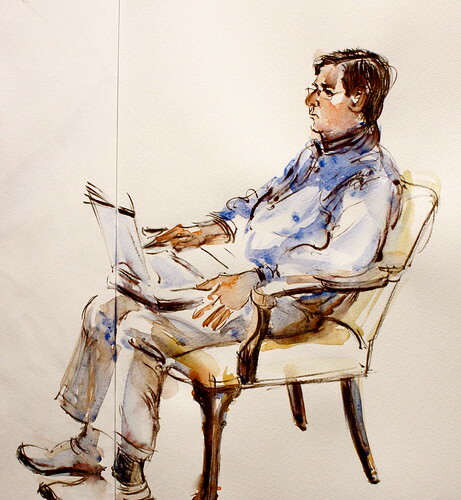 There are so many questions I would like to ask about how you work - do you sketch on the road and then add in colour wash later or make rough sketches and work from these later - I am thinking particularly of the travel work. Do you work from photographs or is it all from sketches? Really inspiring stuff - thanks. I've followed your goals for most of the years you've published them and gotten a lot of inspiration from the way you think, plan, and make art. Thank you. And I finally figured out the travel is part of the art in ways I couldn't have figured. I just came back from Everest Base Camp a few months ago, and art, goal setting, and work are all moving forward from there - amazing how it works! I look forward to seeing the results - and I envy you the workshop with Veronica Lawlor - her sketches are amamzing! It sounds like you have a fabulous year ahead! I'm sure you will be creating beautiful art even if you aren't able to make it to your wished for destinations. The best in 2010. Here's wishing you bold lines and success for your bold plans in 2010! It is a wonderful plan, can't wait to see it happen and be along for the ride!